Brown pelican | Florida Hikes! 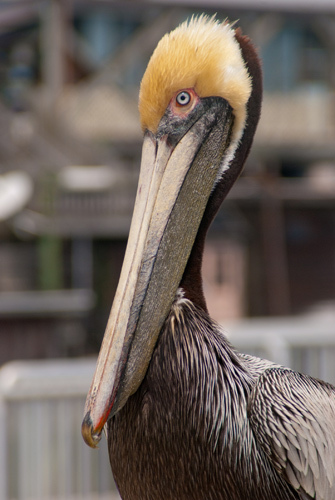 The brown pelican is one of two species of pelicans found in Florida, the white pelican being the other. They have distinctive pouches under their bills and cannot be mistaken for the white pelican due to the size and color difference. The brown pelican is the smallest pelican species worldwide. While we often see a line of brown pelicans skimming the wavetops off the Atlantic Coast, it’s hard to believe they almost went extinct. When a colony of brown pelicans was protected by President Theodore Roosevelt by the proclamation of a new type of public land – the National Wildlife Refuge, which had its start on Florida’s Pelican Island – the plight of the brown pelican was thrust into the national spotlight. As with many other Florida birds with showy plumage, they were being pushed to the brink of extinction by hunters eager to feed the public thirst for plumes on hats. Pelicans are colonial nesting birds. While most of their nest sites are quite secretive, we’ve observed them off Cedar Key nesting on Seahorse Key, which is off-limits to visitors during the nesting season.